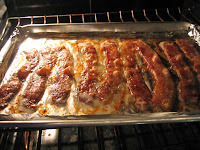 Fat and Happy Blog: Easy way to cook bacon! There are various cooking tips available from hundreds of different sources. So I questioned why I should post more; what makes mine so different? To be honest, I'm not sure mine are different or if you've already seen these tips. But then I thought, you have the option to read the tip or not. If you already k now how to cook bacon in the oven or if you have your own method of cooking bacon then please cook away. If you haven't tried bacon in the oven, then continue reading below to see how simple it is. When I owned the restaurant, we needed a way to cook many slices of bacon at a time - usually 50 slices. I remembered my parents' catering company and how my Mom would cook bacon in oven. Actually, I'm not really sure if she cooked bacon like this for the company for just for the family... there were 7 kids to feed afterall! Yes, 7 kids; my parents are saints, truly! Anyway, it really is quite simple and offers quick, easy clean up; considering how bacon grease stays on everything. 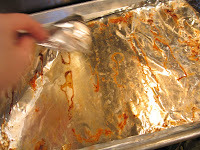 First, cover a cookie sheet pan with tinfoil. 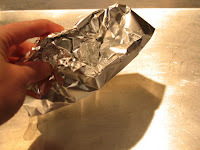 One strip of tinfoil will cover the bottom with just enough the fold up the edges. You want the bacon grease to stay on the foil. Place as many slices of bacon on the foil as you need. Here is where you can get creative - add black pepper and brown sugar for a sweet peppery finish! Now place in a 400 degree oven until they reach desired doneness. I will cook it to varying levels depending on what I'm using the bacon for. After removing the bacon from the pan, pour off the grease into a heat proof tin can if you plan to use it, then simply fold up the grease remains and throw it away. For an absolutely fabulous simple bacon sandwich, look at my recipe for th e fig bacon rolls! And as always, enjoy and be fat and happy! Does the bacon slip off the foil easily when done cooking or does it stick? (I tried doing this this morning and did not put foil down and it was a nightmare. I ended up having to scrape off the bacon with a metal spatula and the bacon is not in bits of pieces.) I might try this one more time but with foil...but only if the bacon does not stick. Live and learn. Hi Lori, I've never had the bacon stick before. Was it really lean? Usually the grease keeps it from sticking. 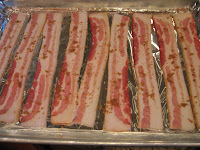 Another option is to set a cookie drying rack on top of the foil and place the bacon on that. The tin foil will still catch the grease for easy cleanup. Let me know how that works! Hot diggity dog! It worked! I put foil in the pan and doubled up on the thin bacon and voila - when it was done cooking, no sticking happened. I was able to take the bacon off the foil with ease! I could not wait to do the bacon so I cooked it tonight.